This article will describe how a Java application can integrate with jWebSocket server – in fact: start the server from within the Java code -and subsequently register listeners that intercept WebSocket communication from other interaction partners such as Web clients. The Java application can also send messages to specific clients or broadcast to all clients. 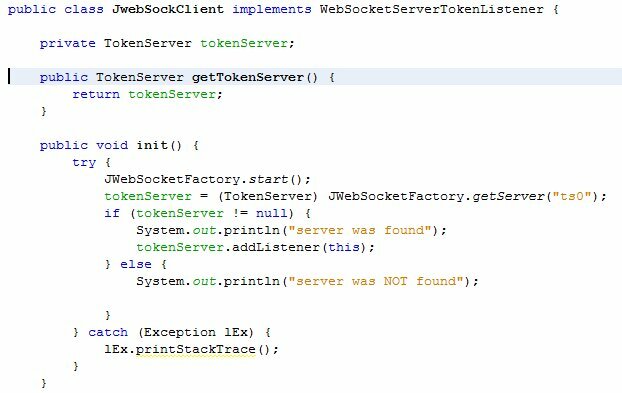 This article will merely scratch the service by describing how a simple Java application interacting in this way with jWebSocket server can be created in NetBeans 7. Finding the information to achieve this was not very easy by the way. And finding out how a stand alone Java application can connect to a stand alone (separately running) jWebSocket server is still slightly beyond my reach. I have created a new Java Application project in NetBeans 7. I have added three jar-files as the libraries for this application. All these jar-files can be found in the JWEBSOCKET_HOME\libs directory. 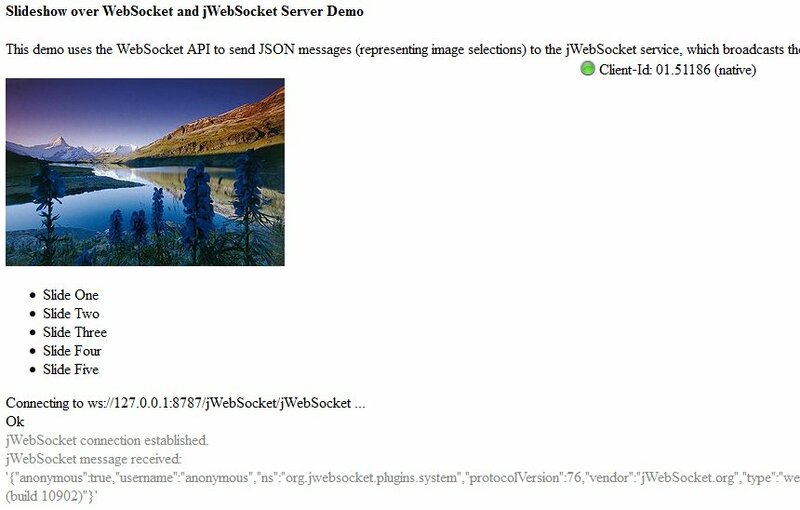 Note: downloading and installing jWebSocket is described in this article: https://technology.amis.nl/blog/14940/first-steps-with-jwebsocket-open-source-java-framework-for-websockets-installation-and-running-samples . This article describes configuring the environment variable JWEBSOCKET_HOME that needs to be set, referring to the directory where the jWebSocket archive was exploded and specifically to the directory that includes the bin directory. In my case: C:\temp\jWebSocketServer-1.0b1\jWebSocket-1.0. 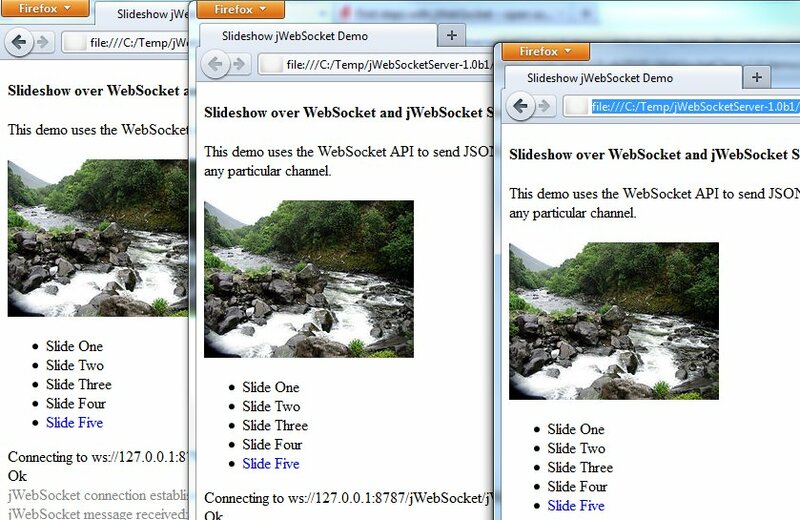 Because the jWebSocket server is started from the exact same configuration file as the stand alone server used in my earlier articles on jWebSocket – on the same host and port and with the same users and roles – the Web Client described for the Slideshow application in https://technology.amis.nl/blog/14949/push-based-synchronized-slideshow-web-application-implemented-using-websockets-and-jwebsocket-server-the-open-source-java-websocket-server is still functioning without any changes. The JwebSockClient was registered as a listener. This can be done because the class implements WebSocketServerTokenListener. This interfaces specifies a number of methods that need to be implemented – and that form the callback handlers for jWebSocket server to invoke upon specific events. At this point, nothing useful is being done with the packets that are received, but it should be obvious that we have a way for web clients to get information to the Java server side through WebSockets. Even more interesting of course would be the reverse route: from server to client, as that is what constitutes the challenging part of push. Because of the reference to the jWebSocket server instance, we can find out which clients are connected to the WebSocket ‘channels’ and we can send messages to these specific clients. We can broadcast messages – not directing them to any particular client – or send messages to specific clients. In this example, I am doing something slightly silly: I am iterating over all connectors and sending the same package to each of them. That of course amounts to broadcasting – so why not broadcast? Well, only to show the iteration over the connectors representing each of the clients and demonstration the option to send a message to a specific client. Note: I would still like to find out how I can connect with a standalone Java class – not one starting the jWebSocket server itself – to the jWebSocket server to start remote websocket interaction. Download sources for this articles (NetBeans project):MyjWebSocketJavaClient.zip . Xebia Blog article on getting started with jWebSocket: http://xebee.xebia.in/2010/10/05/web-socket-communication-using-jwebsocket/. // the following line must not be removed due to GNU LGPL 3.0 license! I have implemented this jWebsockt earlier but encounter some problems after the protocol update by Google. Note: C:\Test\MyjWeSocketJavaClient\src\nl\amis\jws\JwebSockClient.java uses unchecked or unsafe operations. I have not used much time trying to resolve this problem. Normally I just expect things to work. Anyway. It seems that you are right. Implementing a jWebsocket server is still not straightforward.